Very High Speed - 650MHz Typ. The clock input, which is ECL 10K compatible throughout the temperature range, can also be directly coupled to TTL. The clock can also be capacitively coupled to the signal source. Connecting the internally-generated bias voltage to the clock input, i.e. pin 15 to pin 16 centres the clock input about the switching threshold. The two complementary outputs are ECL 10K compatible but internal pulldown resistors are not included, and thus an external resistor to VEE is required. The outputs are capable of driving a 50 ohm load to -2V over the temperature range -40°C to +85°C. The output high level will typically be reduced by 50mV. The TTL totem pole output operates with the same supply and is powered up by connecting VEE (pin 12) to TTL VEE (pin 13). If the TTL output is not required then the TTL VEE (pin 13) should be left open-circuit reducing the power consumption by 20mV. Both control inputs (PE1 and PE2) are ECL 10K compatible throughout the temperature range. Each control input is provided with a pull up resistor, the remote ends of which are connected to pins 6 and 7. This allows the pull up resistors to be unused if so desired, or to be used to interface from TTL. 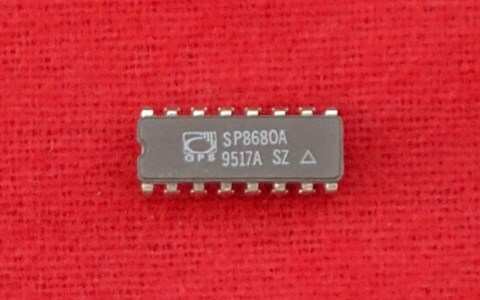 If interfacing to ECL is required then pins 6 and 7 should be left open circuit: alternatively they can be connected to VEE to act as pull-down resistors. When high, the master set input sets the counter to the eleventh state, is asynchronous, and overrides the clock input. All the inputs have an internal pull-down resistor of 50k. The device will operate down to DC but input slew rate must be better than 20V/µs.